This award recognizes �best of boots on the ground� in agriculture. The International Certified Crop Adviser (ICCA) Program and American Society of Agronomy have named Harold Watters of Ohio the 2018 ICCA of the Year. The award recognizes a CCA who delivers exceptional customer service, is highly innovative, shows leadership, and contributes substantially to the exchange of ideas and transfer of agronomic knowledge. Watters was recognized at the Commodity Classic on February 28. He will also be recognized at the American Society of Agronomy (ASA) Annual Meeting in November. Watters� work as an associate professor in Extension at The Ohio State University puts him at the center of a communication hub. Weekly newsletters, monthly columns, field days, academic papers, and presentations at various conferences are part of his repertoire. Experimentation on the 400-acre university research farm (and informally on Watters� own 200-acre farm) gives growers confidence. 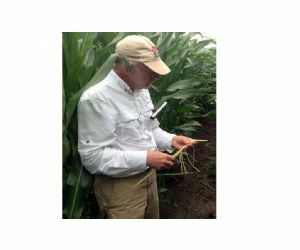 In Ohio, growers with more than 50 acres need to be certified in fertilizer application�a training Watters helped spearhead. Approximately 17,600 producers were trained in four whirlwind years to comply with new Ohio legislation. In addition, employees at more than 40 retail locations were certified in the 4R Nutrient Stewardship Program (right source of nutrients, at the right rate and right time, in the right place). These opportunities don�t stop at the state line for Watters. Over the last six years, he�s taken his agronomic expertise to Ukraine through a USAID program. Watters has been a CCA and Certified Professional Agronomist (CPAg) since 1994. He has been active in the CCA community since. He served on the Ohio and North Central Boards and Continuing Education Committee and as a mentor in the undergraduate Greenfield Scholars program. Ohio State and Wilmington College students may recognize him for his campus visits to promote the CCA program and pre-exam training seminars. Becoming a CCA requires hours of study and a focus on providing the latest science-based advice to growers. Most CCAs continue to develop their skills and knowledge throughout their careers for the betterment of growers and agriculture. The ICCA of the Year Award consists of hotel and travel expenses to both meetings, $2,000 honorarium, a commemorative plaque, and a one-year membership in ASA. The award celebrates a level of proficiency that belongs to an individual and not to a company. ICCA is the largest, most recognized agriculture certification program in North America. Its professional standards are widely respected by industry, academia, and government.